Up with the starlings and out with Sampster and Wolfie. The daily commute along the bay is far better than mainland traffic jams and road rage. 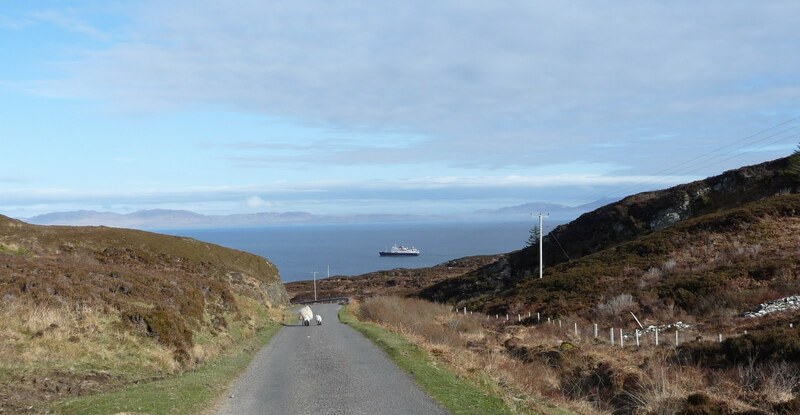 Rush hour here is when the cattle decide to visit the capital and ewes with lambs at foot decide to have a morning jaunt along the island ring road to watch the boats coming and going. Then it was off to do a stint at the Craft Fair to sell an array of locally produced arts and crafts and an opportunity to do a wee spot of knitting. Folk came and went, especially when the ferry came in. It was nice to chat to customers. Many have been regular visitors to the island for years because our Island at the Edge has such allure. Eskie bounced in full of Tigger energy. Living on the north of the island, we do think she doesn't get out that much, as when she does visit the island capital, Scalasaig, all the pent up energy gets released before she heads back up the hill and through the pass. She brought news about a meeting of the Tourism & Marketing Group later in the day. They are drumming up support for an island website to advertise accommodation availability and events. Went along to have a look-see and partake of a nice glass of wine. Eskie and the team are also involved in lots of new initiatives linked to the new website to promote our island, it will be going live at the turn of the year. For those readers not familiar with this little corner of paradise click on these links to find out more: community website the events website and the music festival - a real must for all you traditional Scottish music buffs out there. Back to the homestead to find that Kapitein had been checking the sheep. Big Fella, Wee Girly and the Wee Man are all well. 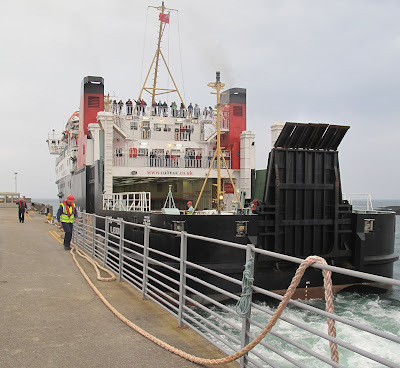 Kapitein has singled out 10 wedders for the next trip to Islay, so more fresh meat on our table soon, and on those of our growing band of loyal customers on the mainland. I'm hoping I'm one of the loyal customers you're referring to.Please!